Brenda Vacarro is invited to spend a weekend with rich guy at his mansion in the country. Unfortunately the weekend party is crashed by some locals looking to wreak havoc. I am old enough to remember when this film came out in theaters. I remember this film very clearly for two reasons, first the film hit theaters with a great deal of buzz from several film festivals where its “home invasion” plot had rattled a good number of critics cages. There was a great deal of talk that it was too disturbing to be rated R and should have been X. The other was that the film generated some talk of Vacarro possibly getting an Oscar nomination. Sure the film was a low budget low brow film. I saw the film when it played on HBO. I was too young to go to the theater to see it so I had to wait for cable, and a late night showing when I could sneak down and see it when the parentals were asleep. My reaction was that it was good, but I couldn’t understand what all the shouting was about. I couldn’t understand why people were so rattled by it, the film was just a variation on a theme. Seeing the film again for the first time in a very long time I was struck by a couple of things. First it’s very much of the time it was made. There is a weight to the characters and the situation that you don’t find in later variations to the theme. Nowadays when you see a film like this it’s all short hand, character development is kept to a minimum. There is a lazy assumption that you know the characters and the situations and we’ll just speed to the cruelty because that’s what you’re there for. 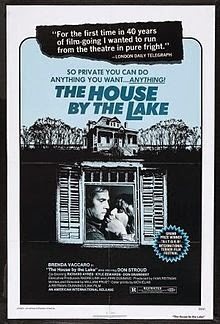 However with House by the lake (the title I know the film by) there are characters. There are real situations and there is a pacing. The film wasn’t tossed off it was made very deliberately. The other thing you notice with the film is that Vacarro is really good. This isn’t typical horror movie heroine. There is a weight to her performance that most of today’s actresses don’t have. While probably not the best performance of the year the film came out, I could see how some people might suggest that she were Oscar worthy. It’s also the sort of performance that makes you wonder why she never got better roles. I like the film. I completely understand why the film stayed in my memory (beyond the hype) after all these years. Worth a look see, more so when you consider the film is playing this Sunday at Lincoln Center’s Scary Movies and you can see it as few people have in the last 40 years on the big screen.